Gasteria thunbergii is a dwarf aloe-like, opposite-leaved succulent, endemic to the Gouritz River south of the Langeberg Mountains of the Western Cape Province. It has showy banded leaves, and thrives in cultivation, both in containers or in rockeries. Plants are stemless, 60-150 mm high, prolific from the base to form small dense clusters 100-300mm in diameter. The roots are slightly succulent, up to 2 mm in diameter. The leaves grow in opposite rows (described as distichous) and are 33-200 mm long and 10-30 mm broad at the base, elongated triangular (linear-triangular), ascending, firm, with the lower leaves becoming spreading (the leaf ends incurved during the dry season). Leaves are dull green, with the upper leaf surfaces (adaxial sides) deeply channelled, and the lower leaf surfaces rounded (convex). The leaf surfaces are covered with dense white, leathery (cartilaginous) tubercles arranged in transverse rows; the leaf margins are leathery with small sharp teeth (denticulate), becoming entire towards the leaf end. Leaf ends are sharp (acute), bearing small hard points (mucros). The inflorescence is a simple raceme 300-450mm tall, ascending, bearing 15-20 flowers. The inflorescence stalk is 2-3mm in diameter at the base, reddish-pink; bracts 10mm long, 2mm broad at the base. Flower stalks (pedicels) are 15mm long. Flowers are 18-20mm long, pink, narrowly ellipsoid at the base and tubular at the end (tube 9-10mm long). The floral leaves are fused, their ends free and greenish white with green median striations. The stamens remain included. The capsule is 18-22mm long and seeds oblong, blackish, 5-6mm long, 2.5-3.0mm wide. Gasteria thunbergii is one of an about 12 Gasteria species with restricted distributions. 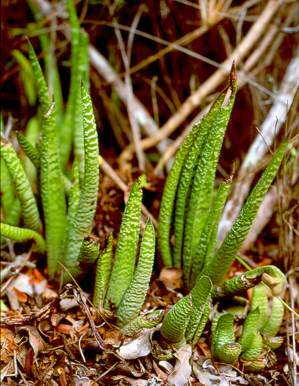 It is related to Gasteria carinata from the southeastern portion of the Western Cape. The latter has short triangular leaves and flowers during spring. Although only known from the lower Gouritz River south of the Langeberg Mountains (Eastern Cape), it is still fairly common in the Southern Cape Valley Thicket vegetation type (Mucina 2006). It also often grows on steep embankments where it is protected from farming practices. The plant is well established in cultivation (ex situ conservation) and is grown by succulent plant growers all over the world. 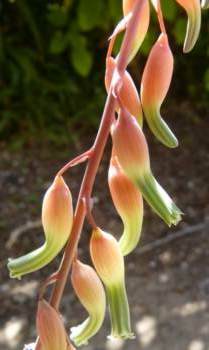 Gasteria thunbergii is Red Listed as Rare (Van Jaarsveld & Raimondo 2009). The Gouritz River drains a large portion of the Karoo (Klein and Great Karoo), and the adjacent land is farmed extensively south of the Langeberg Mountains. 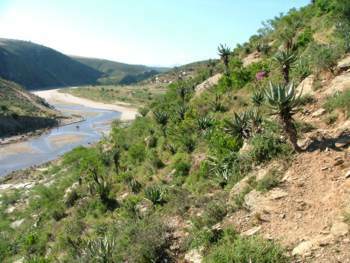 The South Cape Valley Thicket, habitat of Gasteria thunbergii, is confined to banks of the Gouritz River. Our species finds protection below thorny shrubs such as Carissa spp., Azima tetracantha, Searsia longispina and Asparagus densiflorus (Mucina & Rutherford 2006). The specific epithet honours Carl Peter Thunberg (1743-1828), a travelling Swedish botanist and often called the father of South African Botany. He collected this species on his first journey east into what is now known as the Eastern Cape in 1772 in the vicinity of the Gouritz River. Dr N.E. Brown, famous succulent plant student and botanist, named it in 1923 in the botanical journal Bothalia. Although rain falls during summer and winter, and ranges from 250-500mm per annum, there is a tendency toward winter aridity. The average annual daily maximum temperature is about 24°C and the average daily minimum about 12°C. Gasteria thunbergii grows at an altitude of 52-250m, on soils derived from Enon Conglomerate as well as shale outcrops. The soil varies from sandy to loam and is slightly acidic. Although mainly found in dappled shade, it occasionally grows on rocky slopes in full sun. The plant was growing in association with the following species near the Gouritz Bridge: Aloe ferox, Bulbine aloides, Crassula capitella subsp. thrysiflora, C. cotyledonis, C. perforata, C. atropurpurea, Cotyledon elizeae, Euphorbia atrispina, Ornithogalum longibracteatum, Pteronia incana, Asparagus densiflorus and Pelargonium zonale. Larger trees and shrubs in the habitat include Olea europaea subsp. africana, Buddleja saligna, Portulacaria afra, Searsia lucida, Polygala myrtifolia and Chrysanthemoides monilifera. Gasteria thunbergii plants are well camouflaged below the thorny bushes but will be eaten by porcupines (Erinaceus frontalis), dassies (Procavia capensis) and other herbivores. Unlike similar-looking (and closely related) Aloe species, the leaf sap is not bitter and leaf fragments on the ground root rapidly to form new plantlets. Gasteria thunbergii flowers during late summer and autumn (March to April), but sporadically at other times as well. 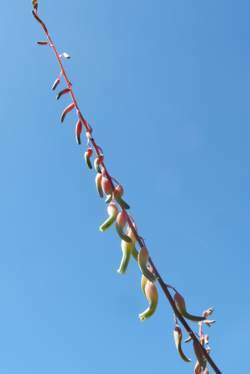 It is pollinated by sunbirds and the seeds, which are borne on the elongated inflorescence, as with most Gasteria species, are wind-dispersed. Seeds ripen during autumn and winter coinciding with the winter rainy season. Like many other Gasteria species, its leaves are brittle and will proliferate once fallen to the ground. Apart from its horticultural use, the plants are not used medicinally or otherwise. Gasteria thunbergii is a slow-growing, attractive plant with horticultural appeal. It is characterised by its leaves with their decorative warty (tuberculate) transverse zebra-like bands, elongated and tapering to sharply pointed tips. The leaves turn reddish during the dry season. This species is easily propagated by division, offshoots, leaf cuttings or seed. If grown in shady conditions, the leaves tend to be longer and greener, compared to plants that are grown in full sun with much shorter compact leaves. Gasteria thunbergii thrives in cultivation (on window sills) and does best as a containerised plant or grown in miniature rock gardens. It is a prolific grower and its stoloniferous nature soon ensures dense clusters. Although G. thunbergii is a slow grower, it thrives out-of-doors and is best cultivated in Thicket Gardens (Van Jaarsveld 2010), or similarly dry Mediterranean-type gardens in other parts of the world where frost is not too severe. Plants prefer partial shade, and should be protected from full sun in hot climates. Plants should reach flowering size in about three years. To obtain pure seed it is best to hand-pollinate plants. This can be accomplished by using a sharpened matchstick to transfer pollen to the stigma of a genetically different plant, thus ensuring that the species breeds true. Gasteria thunbergii plants are easily propagated from seed, stolons, or leaf cuttings. Apply a fungal inoculant or fungicide when growing plants from seed. Sow seed preferably during spring or summer in a shady position in a sandy, slightly acidic soil. Cover with a thin layer of sand and keep moist. Germination is usually within three weeks. Seedlings are slow-growing and are best planted out once they are large enough to handle. Propagation from leaf cuttings is best undertaken in spring. Allow the leaf cutting to form a heel by placing it on a dry window sill for 1-3 weeks. Cuttings are best rooted in a small container in a well-drained medium. Once rooted, plantlets will appear at the base of the leaf--these can be detached once they are strong and large enough to handle. Feed plants with organic plant food (compost or any other liquid fertilizer). Gasteria thunbergii can be watered at any time of the year, but watering should be reduced during winter. Glen, H.F. & Germishuizen 2010. Botanical Exploration of Southern Africa edition 2. Strelitzia 26. South African National Biodiversity Institute, Pretoria. Van Jaarsveld, E.J. 1994. Gasterias of South Africa . Fernwood Press, Cape Town. Van Jaarsveld, E.J. 2007. The genus Gasteria , a synoptic review. Aloe 44(4): 84-103. Victor, J.E., Van Jaarsveld, E.J & Dold A.P. 2009. Gasteria baylissiana . In D. Raimondo, L. von Staden, W. Foden, J.E. Victor, N.A. Helme, R.C. Turner, D.A. Kamundi, & P.A. Manyama (eds). Red List of South African plants 2009. Strelitzia 25. South African National Biodiversity Institute, Pretoria.